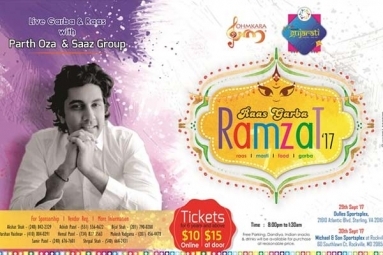 Ohmkara in association with Aapne Gujarati Washington DC proudly presents "Raas Garba Ramzat 2017" with Parth Oza and Saaz Entertainment Group!!! Please join us with your friends and family this Navratri 2017 in Rockville MD. Live Orchestra and Dynamic Performer straight from Ahmedabad, Dr Parth Oza & Saaz Indian Music along with his talented crew!! !